During your shooting practice, your target will normally tell you what you are doing whether its right or wrong. These targets were the result of a practice session where Steve and I were shooting the IDPA 5x5 classifier. Each target shows the results of six classifiers and we only taped the shots that were outside the zero-down scoring ring. Steve was shooting an XD(M)® 4.5" Model for all six classifiers. I shot my SIG P365 for the first two and a P320 Carry for the next four classifiers. 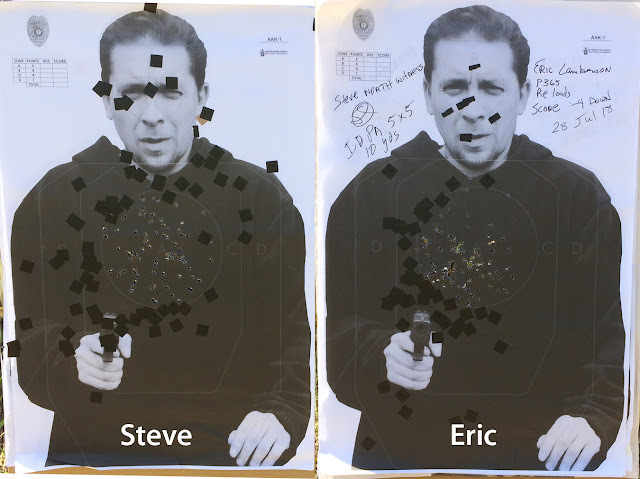 Steve’s target on the left shows a relatively normal distribution of shots around the zero-down scoring ring. Some of the down three and misses were a result of speeding up to ensure we were shooting master times while doing our best with points. Steve fired one String #1 in under 2 seconds—really quick; however, points not so good. Steve’s target shows that he probably is executing the fundamentals correctly and just needs to tighten up his stance and sight alignment. My first two classifiers with the P365 were Expert runs. I am getting better with the P365 and beginning to shoot Expert on demand without a warm up. I still do not have a proper holster (working on it) and that is causing a few issues with my draw. I then switched to the SIG P320 Carry. Most of the shots on my target (on the right) show a distribution to the lower left of the zero-down scoring ring. Although some of the down threes were also a result of me speeding up to ensure I was shooting master times, the target indicates that I am tending to jerk the trigger. This is a problem that creeps up on me when I have not been practicing as often as I should and practicing with a deliberate focus. Out of four classifiers, the first was a Sharp Shooter (its been a long time since I put one of these in my shooting log) and three solid Experts for the next three as I applied a more deliberate focus. During a practice session, your target will tell you what you are doing right and wrong. You must learn to read your target and then correct the errors to progress. Your goal of course is to do the Same Thing, the Correct Way, Every Time.